Author(s): Deirdre O'Regan, A.C. Kokaram. Proceedings: Conference for Visual Media Production (CVMP '09), pp. 35--44, 2009. This paper presents a new non-photorealistic/stroke-based rendering (NPR/SBR) framework for the stylization of videos featuring head shots of people, such as home videos, movies, and camera mobile phone clips. Spatiotemporal skin and edge detection are used to locate and emphasize the semantic content in the stylization process. 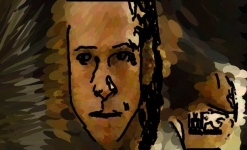 The SBR portion of the algorithm features novel techniques for motion expression with elliptical brush strokes, brush stroke anchor point distribution, spatio-temporal color-sampling, and brush stroke animation with regard to state-of-the-art issues such as object occlusion and uncovering in the source video. A wide user-accessible parameter space and finishing touches such as cartoon-like edge decoration and other quirky effects empowers a variety of artistic outputs. The resulting stylized sequences are fun and interesting with regard to compression, summarization, motion visualization, story-boarding and art. Both the semantic content, and underlying video motion is highlighted and summarized on every frame of the stylized output sequence.